The days have been blurring together, an amalgam of daily commutes, hastily pieced together dinners, and the bright glow of the television screen. Each day feels the same in color and energy as the one that came before it. This routine, exciting once, grows monotonous. While the familiarity may be comfortable, the pattern feels stagnant and tired. After weeks of this repetition, I needed variety, a fresh feeling and a new experience. So I took it upon myself to make a change. I joined a hot yoga studio. I signed up for glass blowing classes. I announced to my boyfriend that we were going to go for a walk. Sometimes I forget I have the power to change my everyday. Baking is one of the activities I do to keep life interesting. As a recipe developer, I rarely come back to the same recipes once they are complete, trying to invent new takes on old favorites instead. The dessert table becomes an ever evolving area of flavors and textures. This Caramel Apple Crumble Pie was born from a combination of two of my favorite fall desserts: apple crisp and apple pie. While there will be a few failures now and then, when the recipe comes together as easily as this recipe did, it turns out right. Caramel Apple Crumble Pie brings together spiced apples, flaky pastry, and a crisp oatmeal crumble. Drizzled in warm caramel, the dessert becomes a play on autumn flavors and textures. Serve with vanilla ice cream and enjoy alongside friends and family. For the apple filling, in a medium bowl, coat the apple slices with lemon juice to prevent browning. Add the brown sugar, flour, spices, salt and boiled cider and toss over the apples until they are evenly coated. Set aside. For the crumble topping, beat together the butter and brown sugar until light. Stir in the oats, flour, spices, and salt until uniform. Set aside. On a lightly floured surface, roll out the pie dough round into a 12-inch circle. Place the round into a 9-inch pie plate (or tart pan), folding the edges under and pressing into a decorative pattern. Place the prepared apples into the pie round, mounding them in the center. Break off small pieces of the crumble topping and sprinkle uniformly over the top. Brush the exposed edges of the pie dough with milk to help them brown. Bake for 55-60 minutes, or until the crumble and crust are golden brown. If the edges begin to darken too quickly, cover with aluminum foil to prevent additional browning. Cool the pie for at least 3 hours before slicing to allow the juices to set. Drizzle each slice with 1-2 tablespoons of warm caramel sauce before serving. 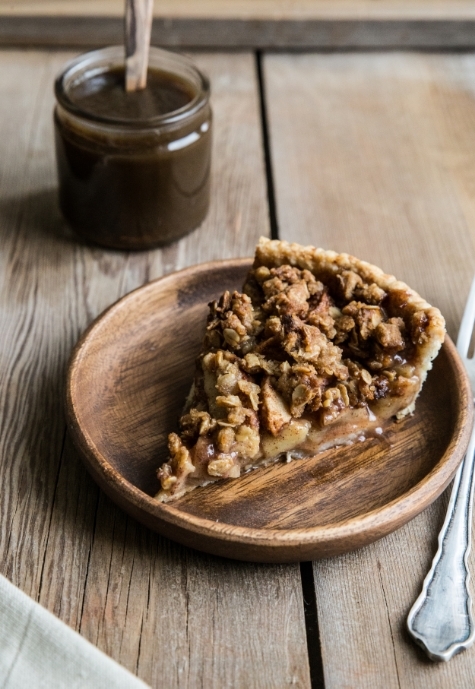 *To create a vegan version of the pie, use a dairy-free margarine for the butter in the crust and crumble (I prefer Earth Balance Vegan Butter), almond or soy milk for brushing, and a recipe for vegan caramel sauce.